Columbia’s Carmen and John Thain Center for Prenatal Pediatrics is now offering fetal intervention to repair myelomeningocele, a form of spina bifida associated with a wide range of complications including early death, paralysis, and bowel and bladder dysfunction. Prenatal intervention has been shown to significantly improve myelomeningocele outcomes by decreasing the need for cerebrospinal fluid shunting and improving motor function. 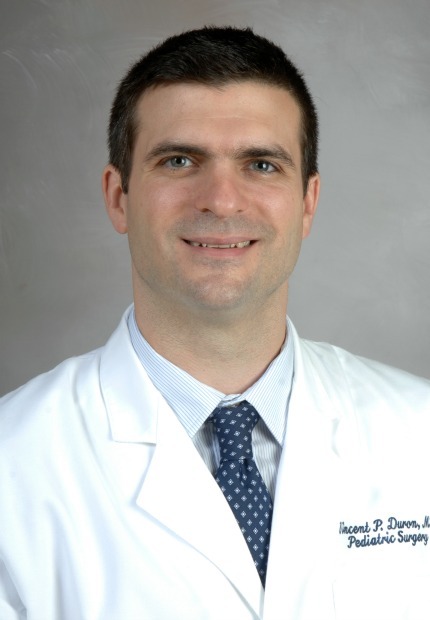 In a collaborative effort, Vincent Duron, MD (Pediatric Surgery) and Russell Miller, MD (Maternal Fetal Medicine) have assembled a multi-disciplinary team of experts to initiate the Open Fetal Surgery Program at Columbia. “The division of Maternal Fetal Medicine at Columbia has a long history of contributing newer and more effective ways of addressing congenital defects,” says Dr. Duron. “Our institution supported the Management of Myelomeningocele (MOMS) Study, the NIH-sponsored multicenter clinical study that showed that prenatal surgery significantly reduces the need to shunt fluid away from the brain, resulting in improved mental development and motor function, and increases the likelihood that a child will be able to walk unassisted." For more information about maternal-fetal surgery for myelomeningocele, please see the American College of Obstetrics and Gynecologists Committee Opinion #720 in Obstetrics & Gynecology 130(3):e164-7, September 2017. To learn more about this program, please call 877-THE-BABY.